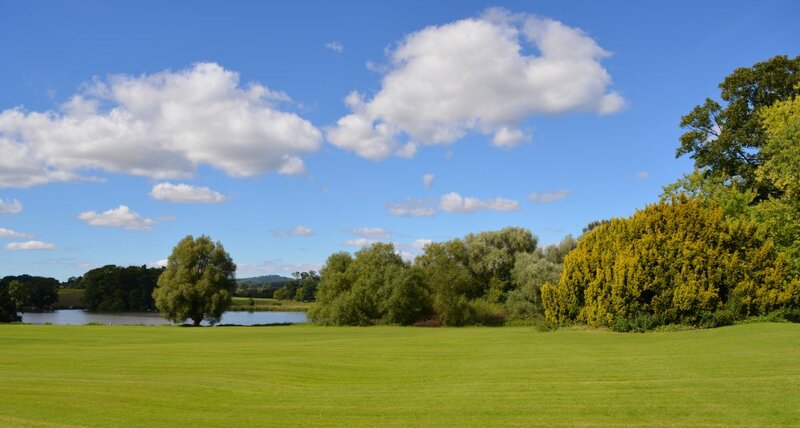 The entrance to Newburgh Priory and the lake in the grounds below it on the road to Coxwold. 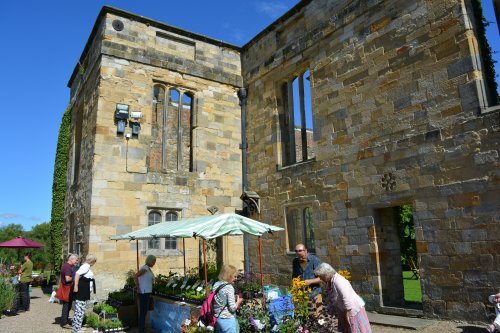 Newburgh Burgh is based on a Tudor manor house of the 15th-16th century that was built from the original medieval Augustinian Priory buildings founded in 1145. 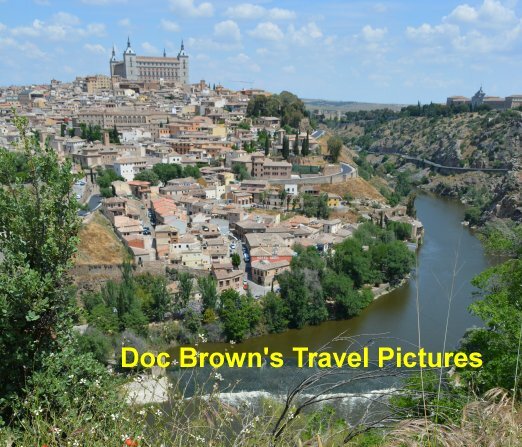 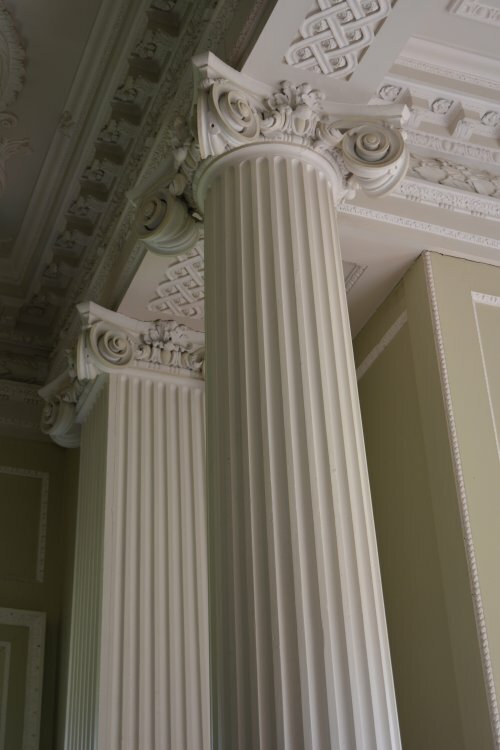 Various modifications have been carried out and added to over the following centuries. 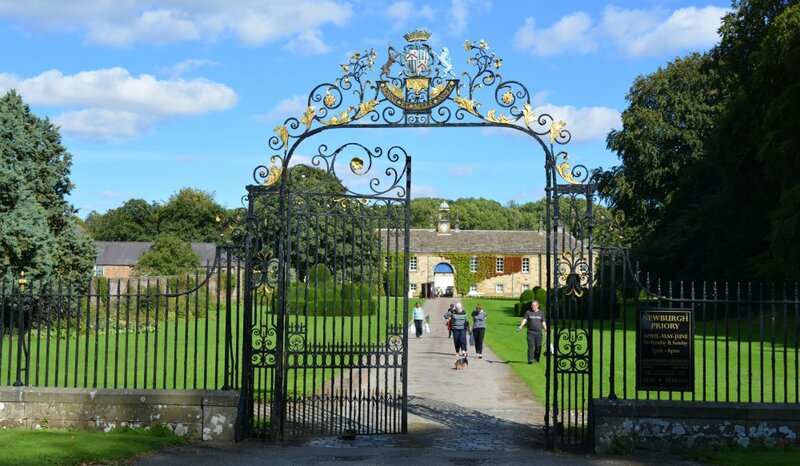 The fine wrought iron entrance gates to Newburgh Priory and a much more sunny day on the occasions each year when the public are allowed to visit. 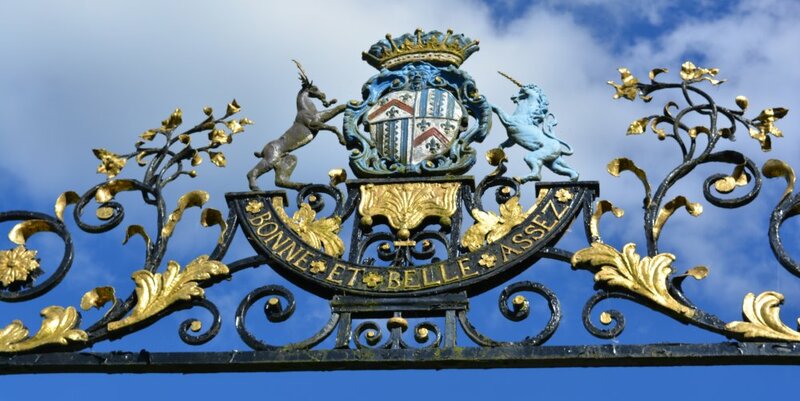 The coat of arms on the entrance to Newburgh Priory, "BONNE ET BELLE ASSEZ"
The Priory was dissolved in 1529 and went to Anthony Bellasis, Henry VIII's chaplain. 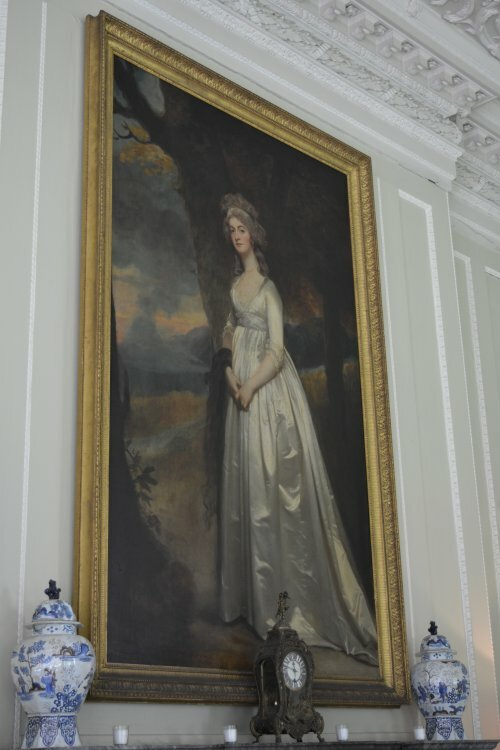 It remained in the Bellasis family, who later became Viscounts and then Earls Fauconberg. 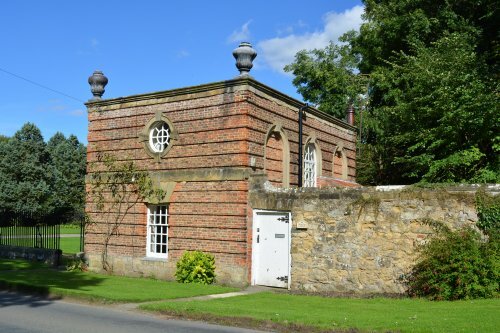 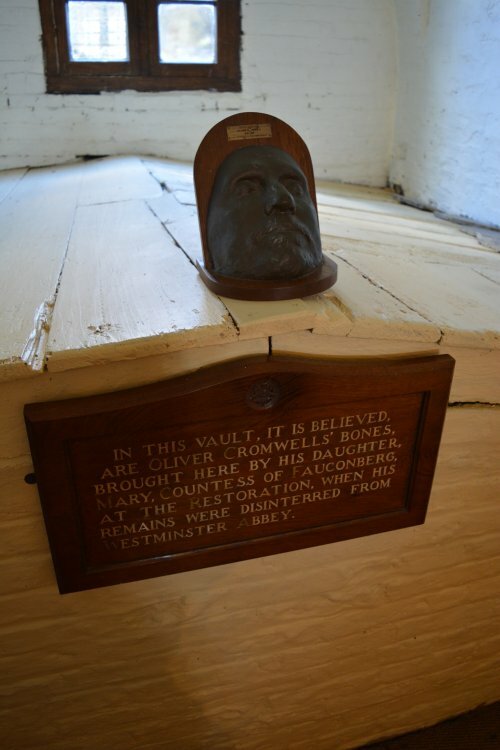 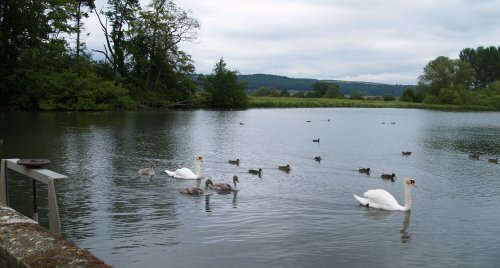 Newburgh is still lived in by their descendents, by the present Baronet and his wife, Sir George and Lady Wombwell and their two children Stephen born 1977 and Sarah born 1980. 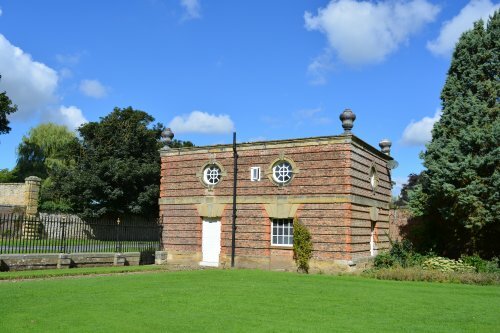 There are two pavilions, one on either side of the Newburgh Priory entrance. 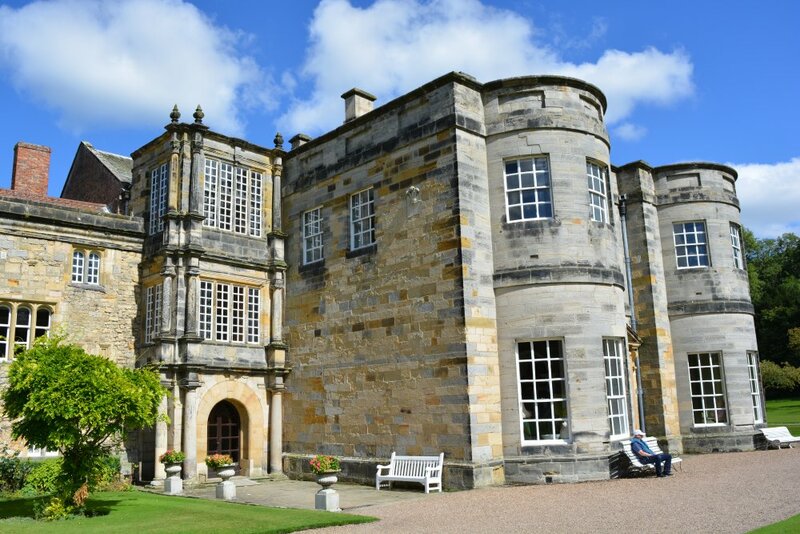 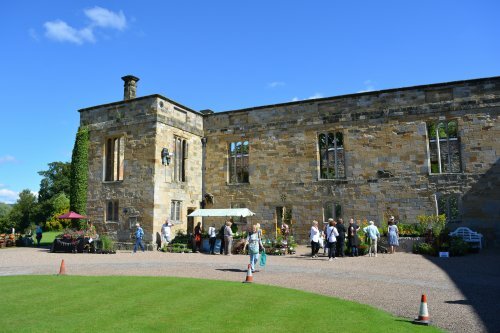 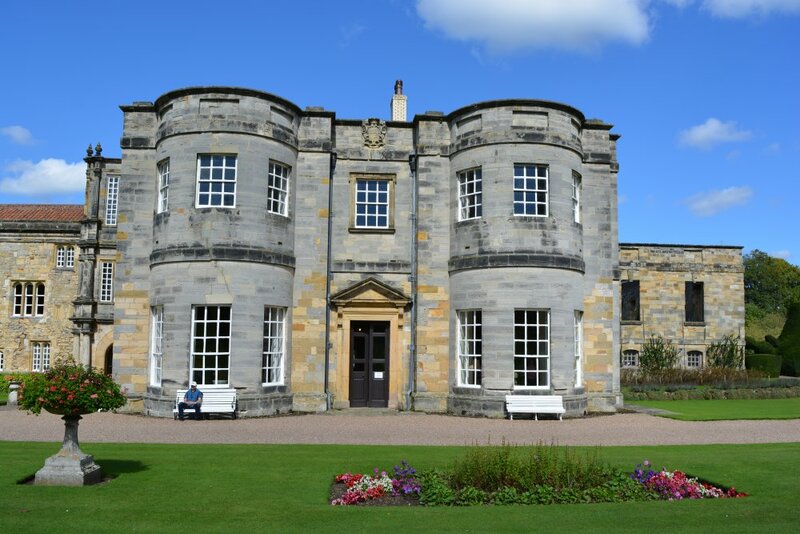 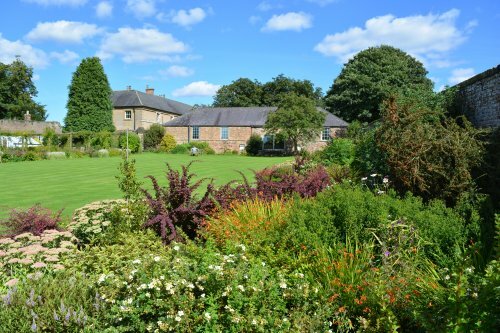 The large house, now known as Newburgh Priory, originates from the Priory and now consists of two periods of 18th century buildings, some early 17th century work and older stonework of an indeterminate medieval date. 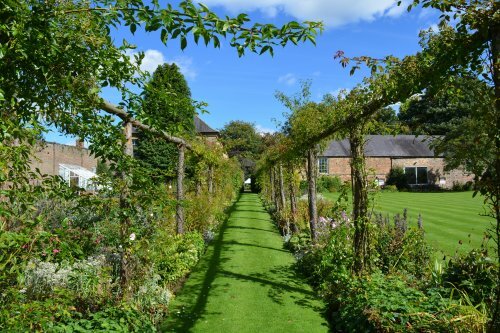 The view down the drive to the stable block of Newburgh Priory. 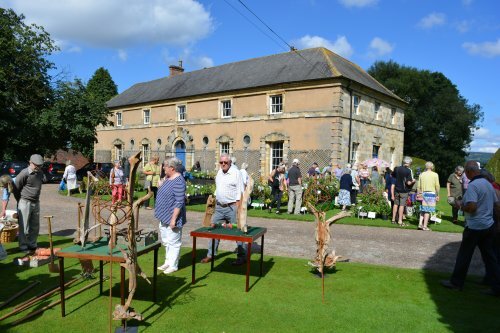 Various stalls by the building near the walled garden of Newburgh Priory. 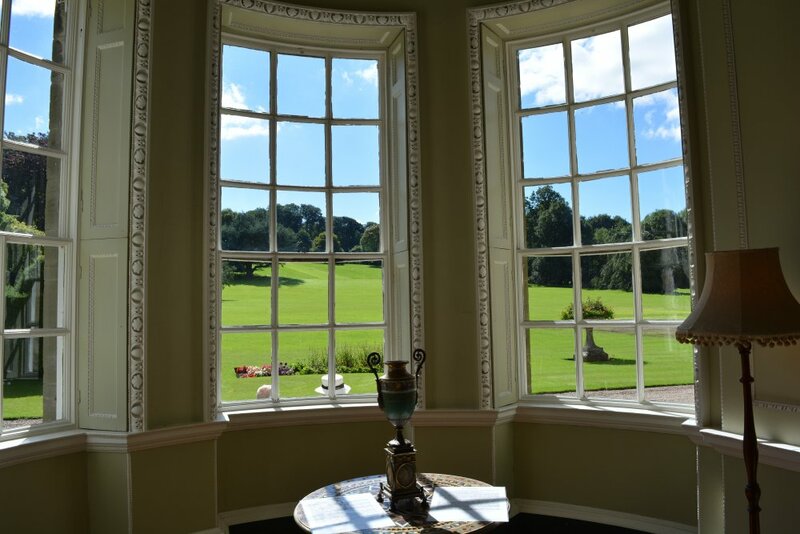 Looking down from the north side of Newburgh Priory towards the lake. 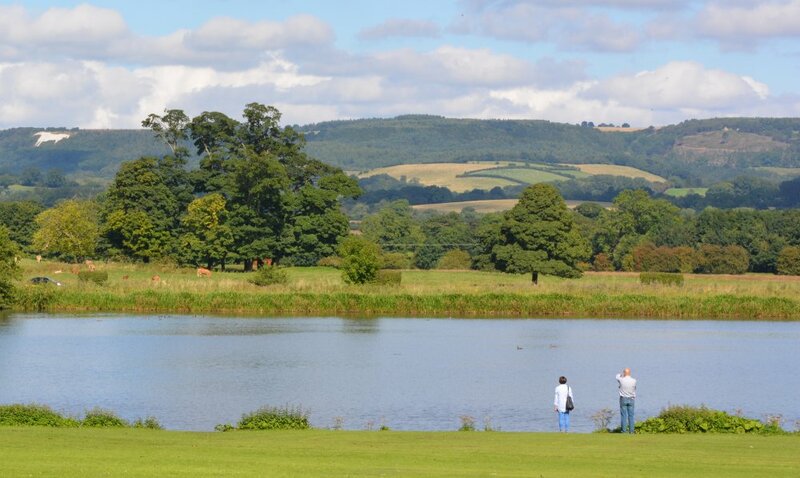 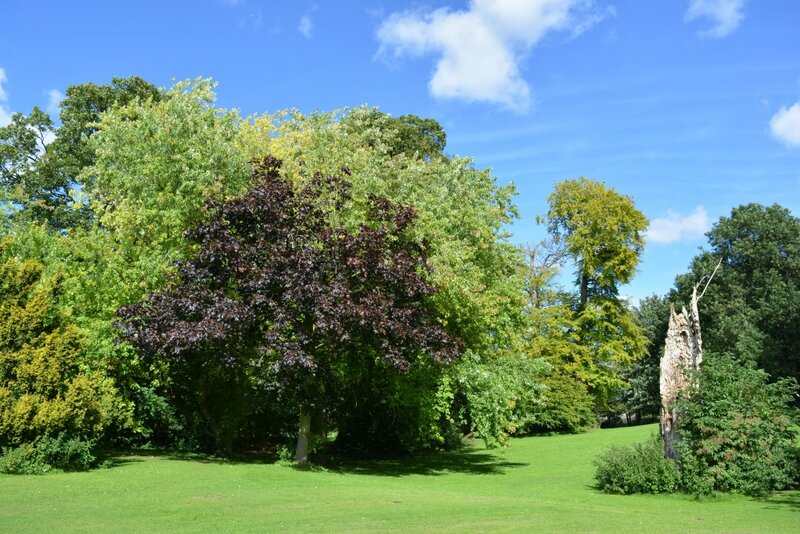 The White Horse of Kilburn is visible across the lake in the grounds of Newburgh Priory. 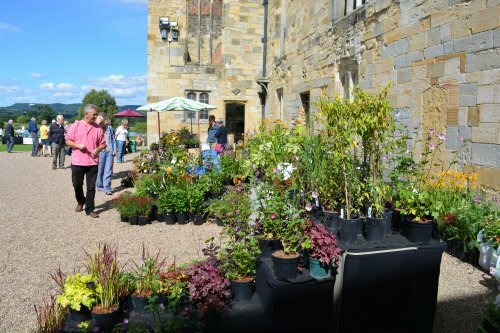 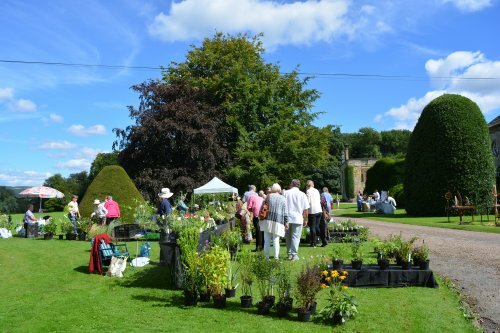 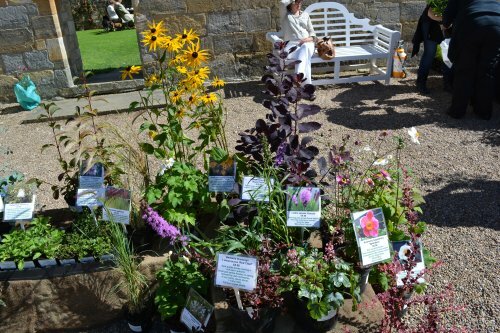 Lots of plants for sale in Newburgh Priory, on the rare days it is open to the public. 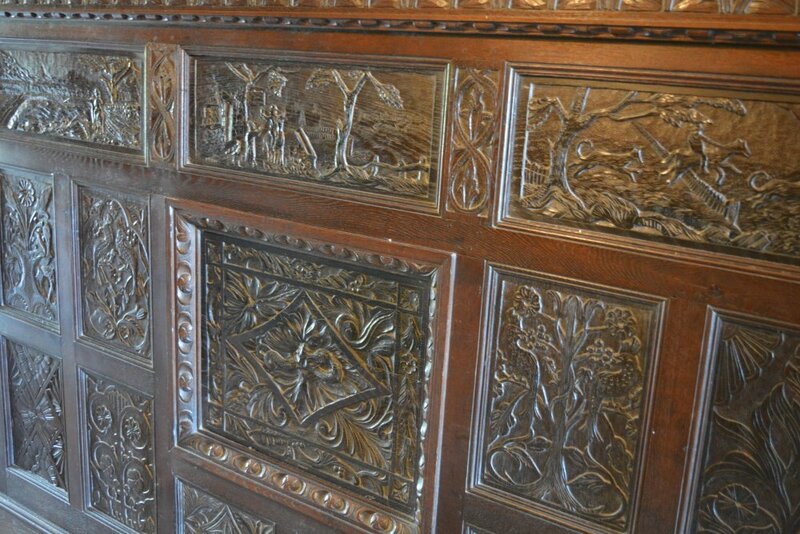 Newburgh Priory has some fine oak panelling in the main building. 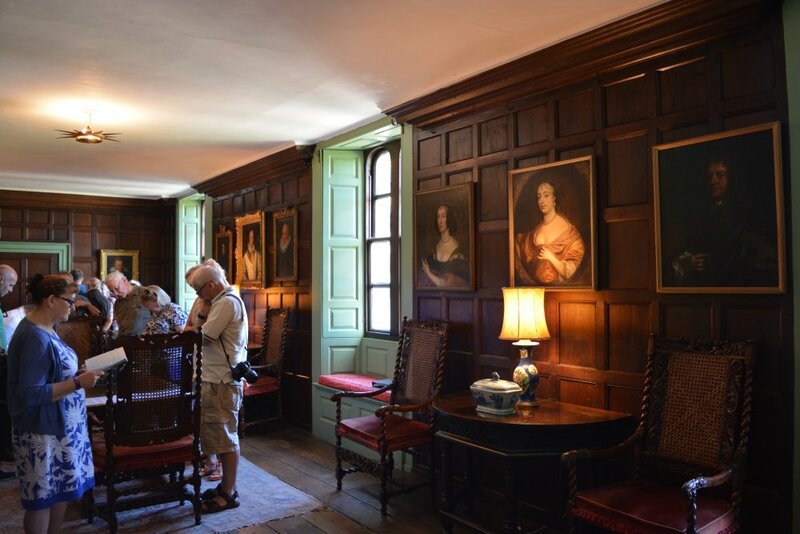 A Newburgh Priory room full of portraits. 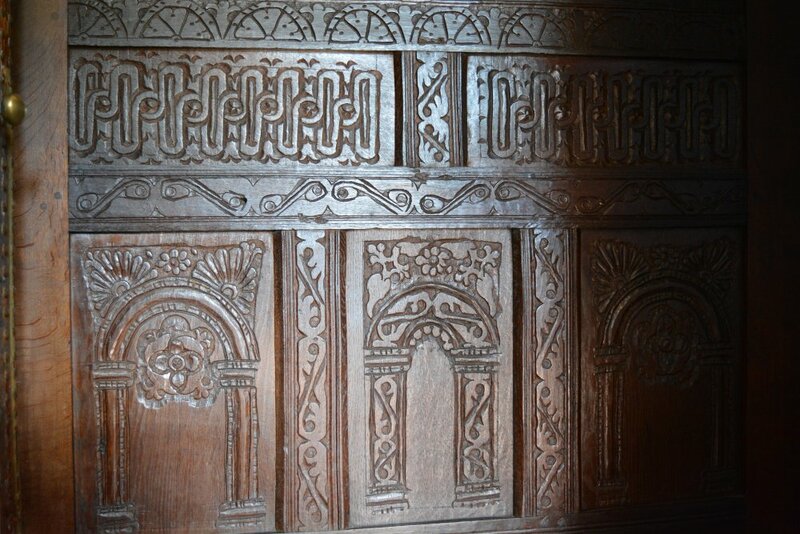 Some more of Newburgh Priory's fine oak panelling. 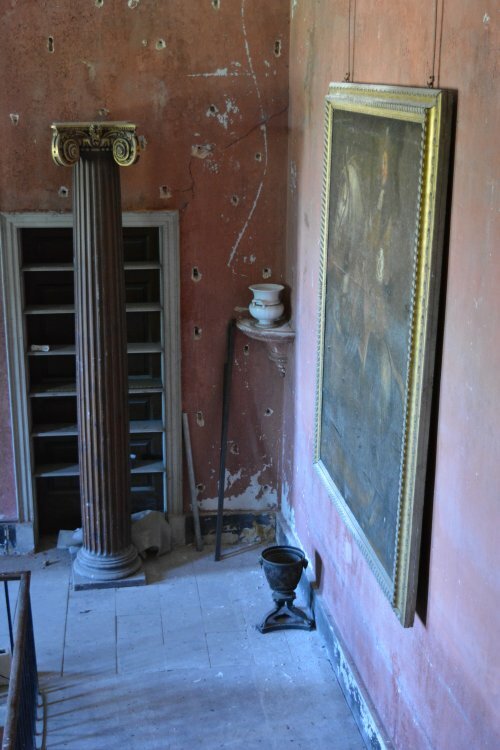 Parts of Newburgh Priory have not been renovated, in the process of? 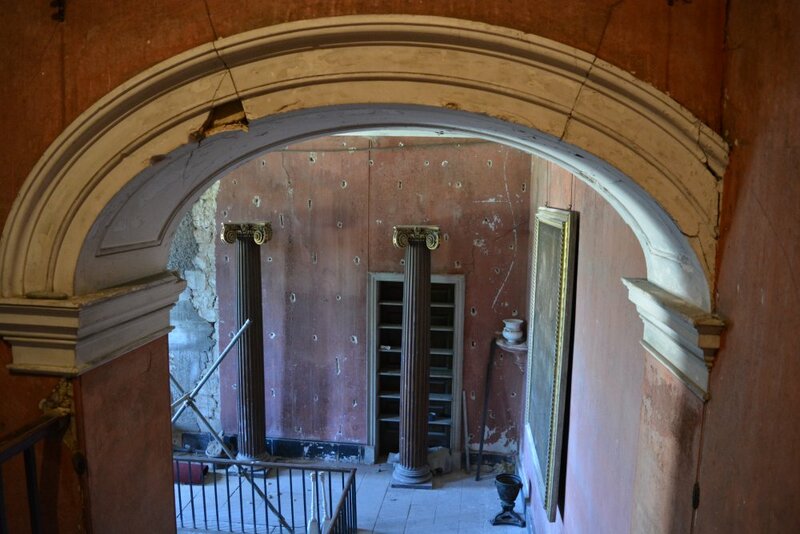 Some dilapidated columns and fancy lamp holders in Newburgh Priory. 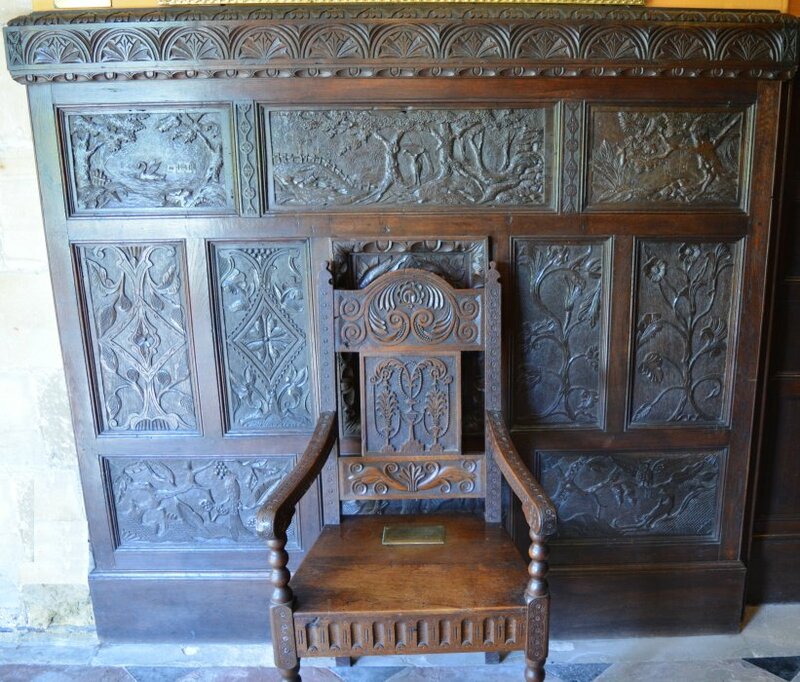 A fine oak chair and panelling in Newburgh Priory. 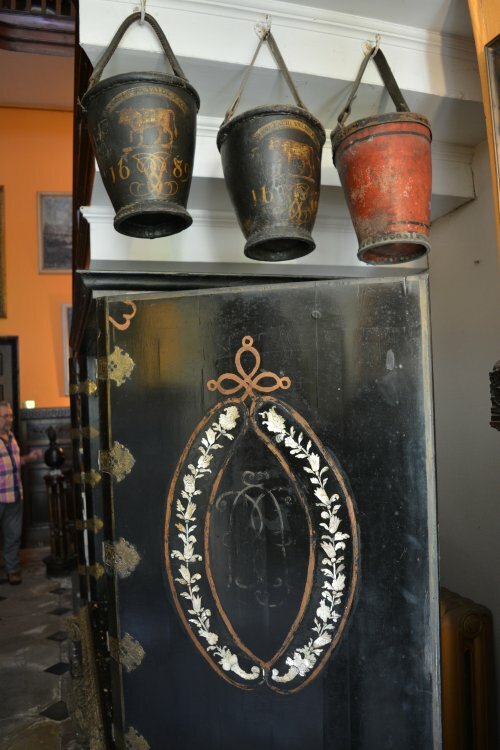 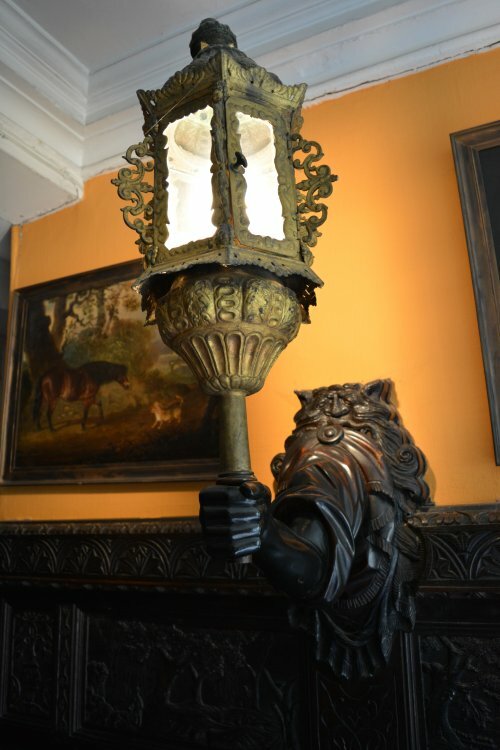 Some old fire buckets along side the extravagant lamp fittings of Newburgh Priory. 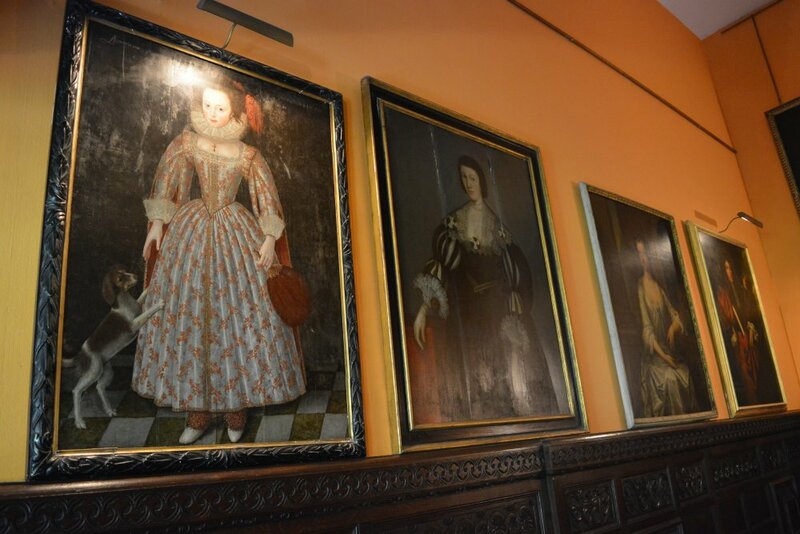 More portraits in Newburgh Priory. 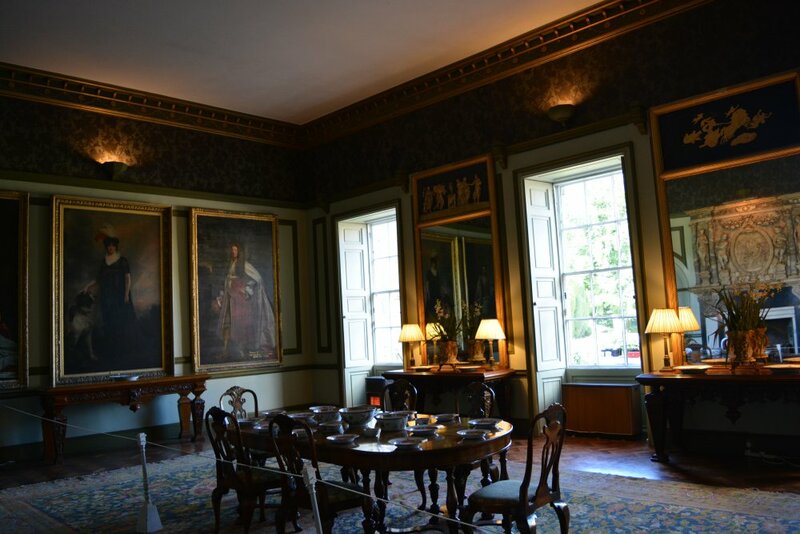 The 'Breakfast Room' of Newburgh Priory. 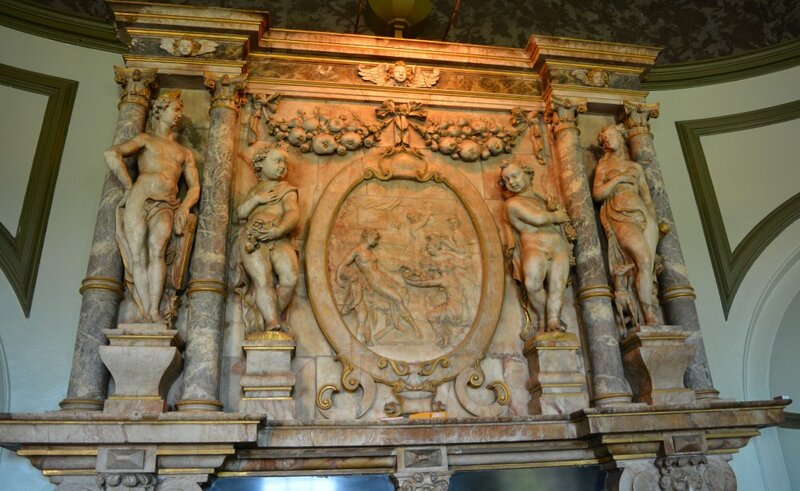 The huge 'Baroque' alabaster sculpture in the 'Breakfast Room' of Newburgh Priory. 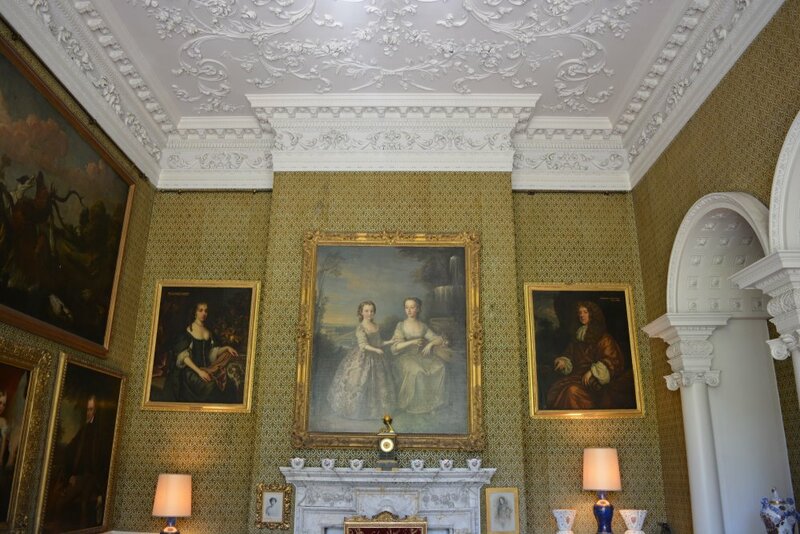 More fine paintings in the 'Breakfast Room' in Newburgh Priory. 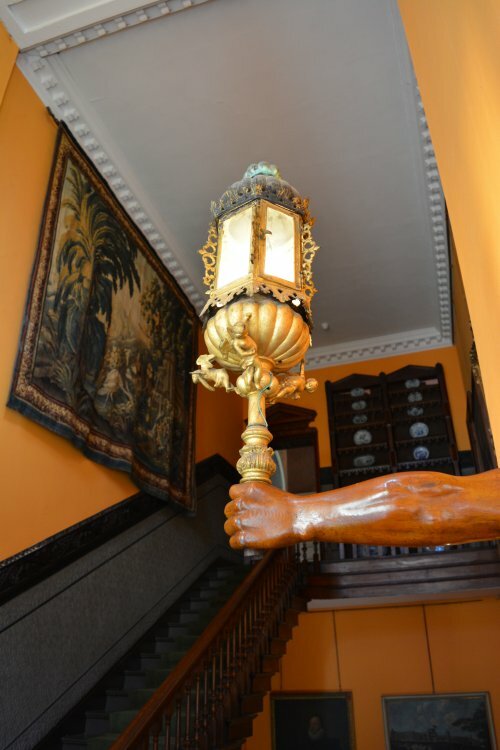 Fine paintings, furniture and column arcade in the ? 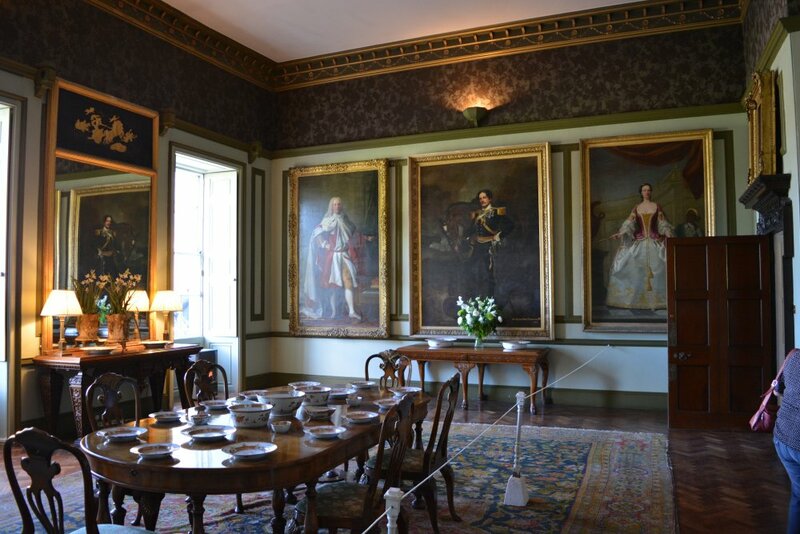 room of Newburgh Priory. 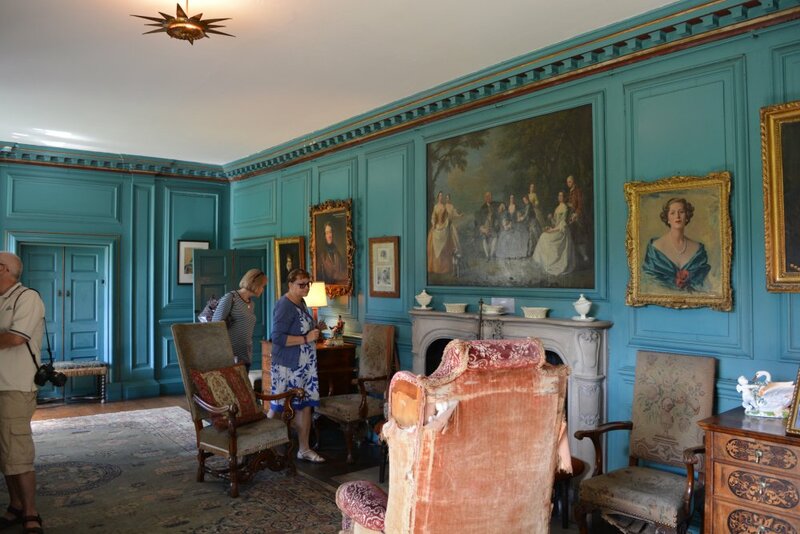 The view south from one of the Early Georgian rooms of Newburgh Priory - the small drawing room I think. 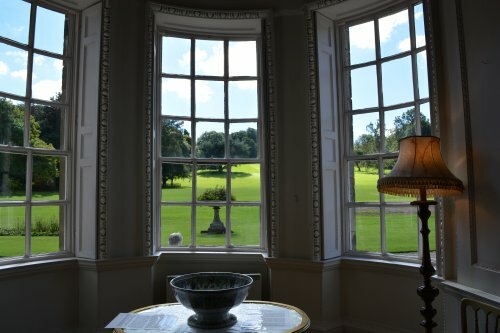 A beautiful room and a fine view! 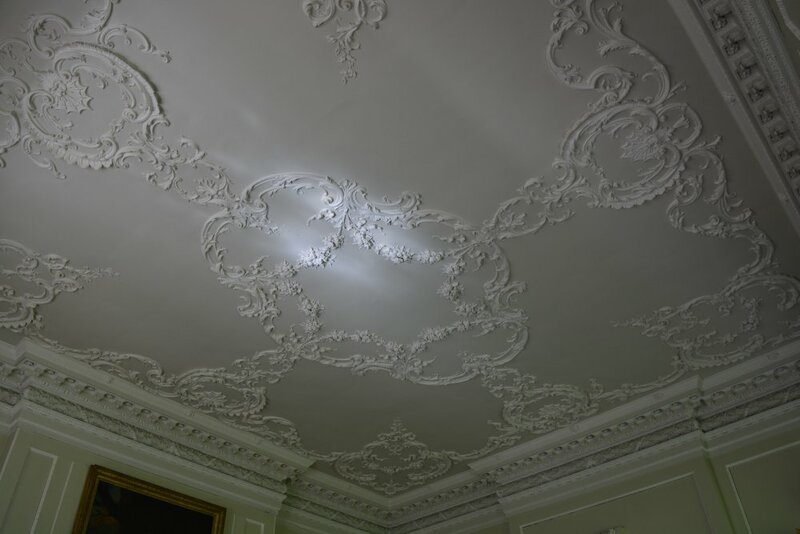 The ? 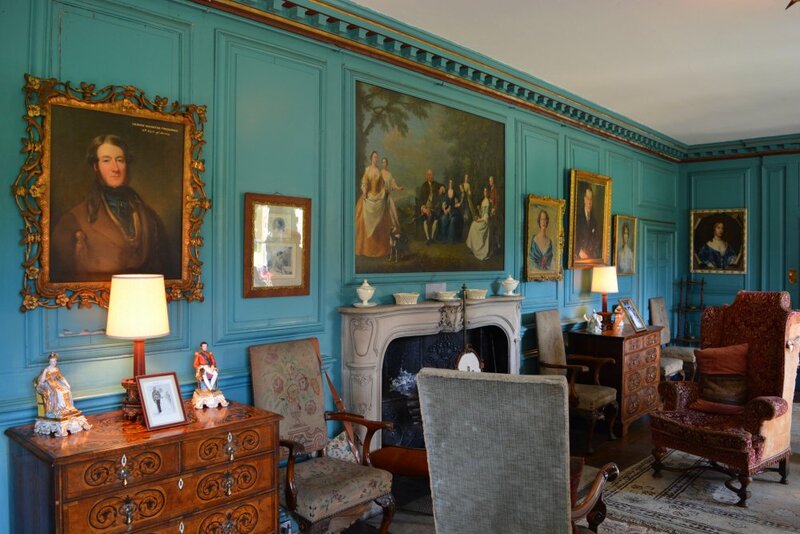 room of Newburgh Priory. 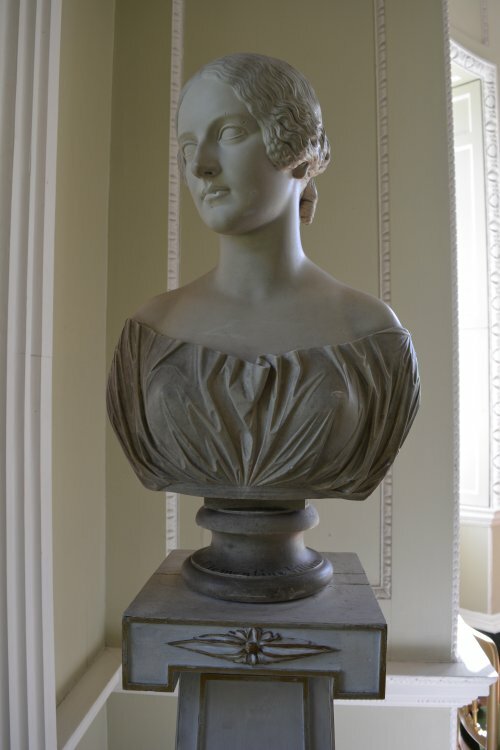 A fine bust and ? 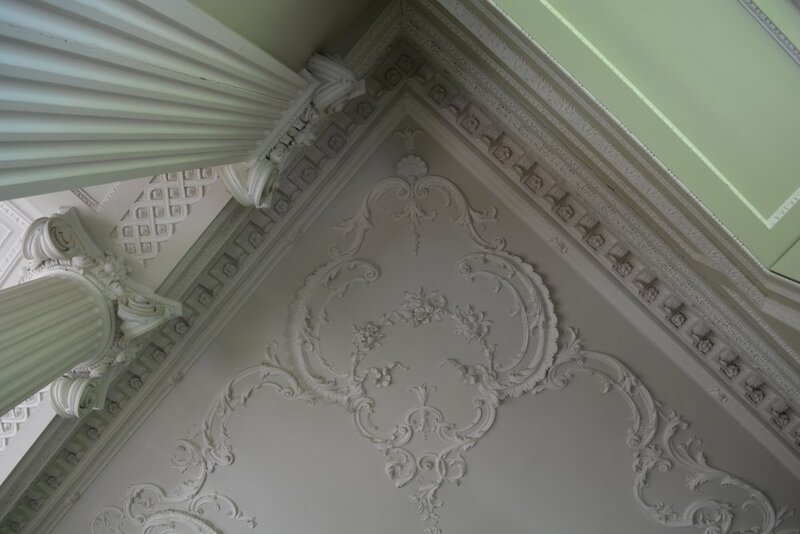 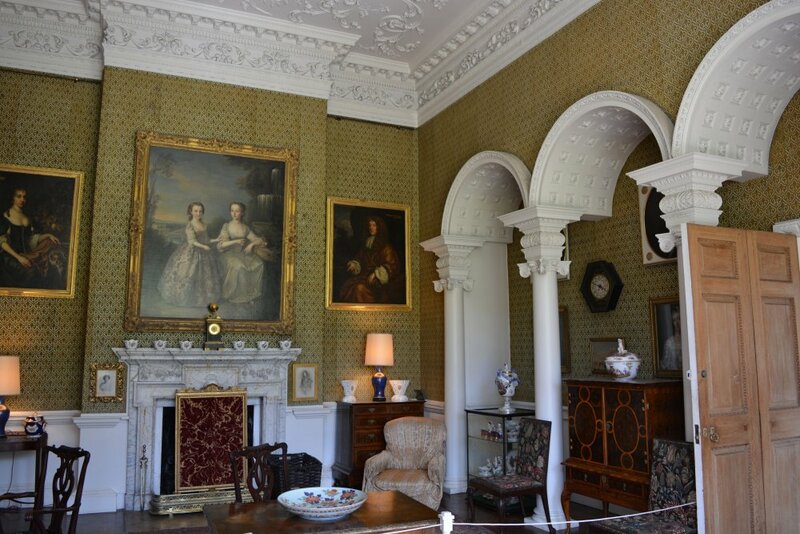 ionic columns and arches in the small drawing room of Newburgh Priory. 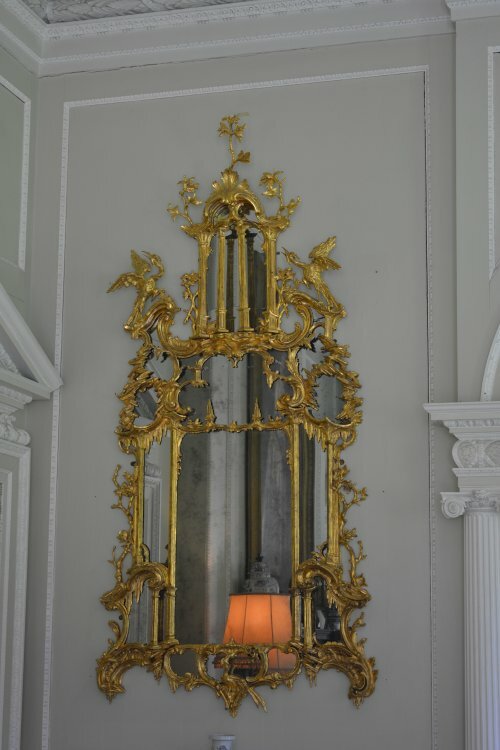 An elaborately decorative mirror and portrait in the ? 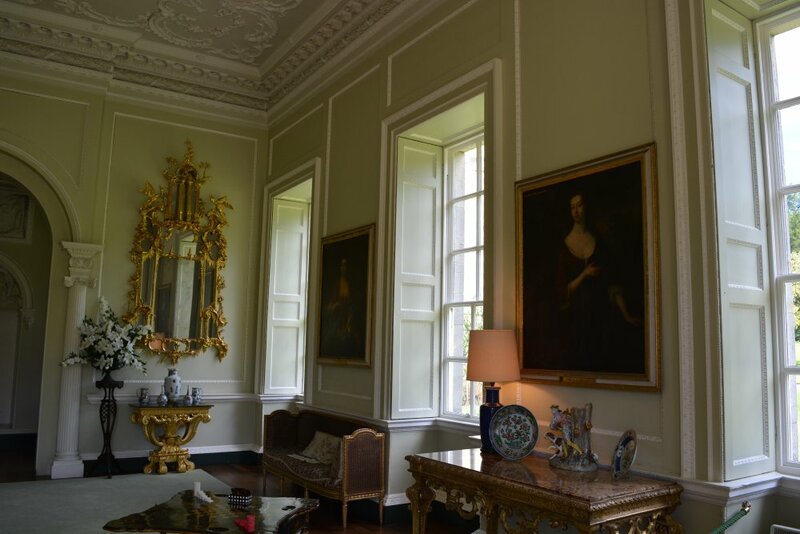 room of Newburgh Priory. 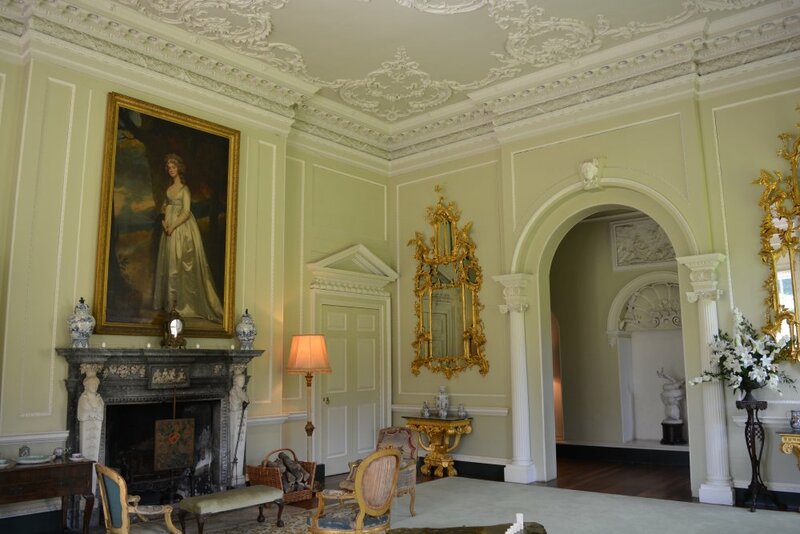 The middle range of Newburgh Priory. 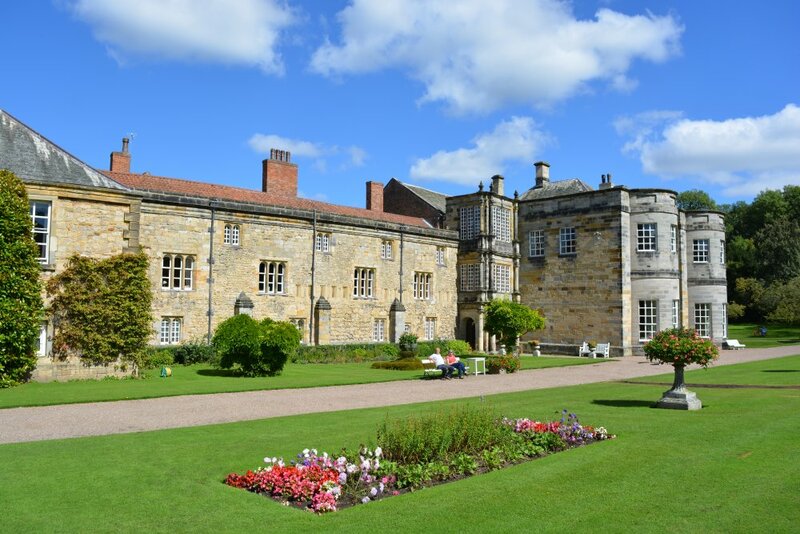 A view of most of the south side of Newburgh Priory. 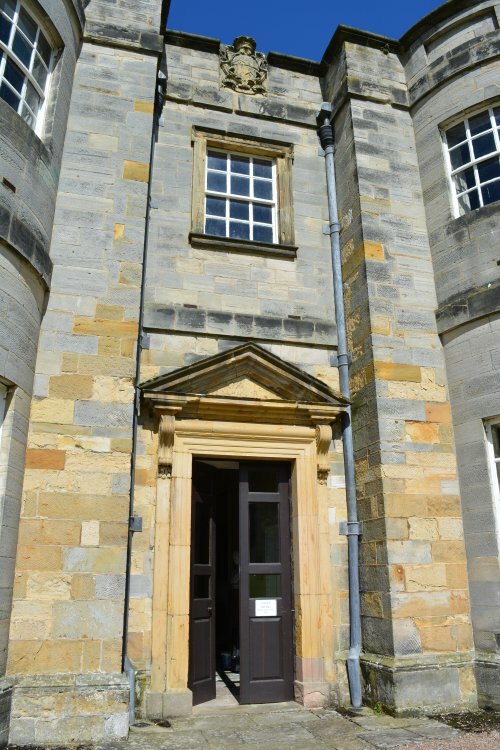 Right: The Early Georgian doorway in the eastern side of the south front of Newburgh Priory, it leads into a passage where the two finest rooms are on the left and right. 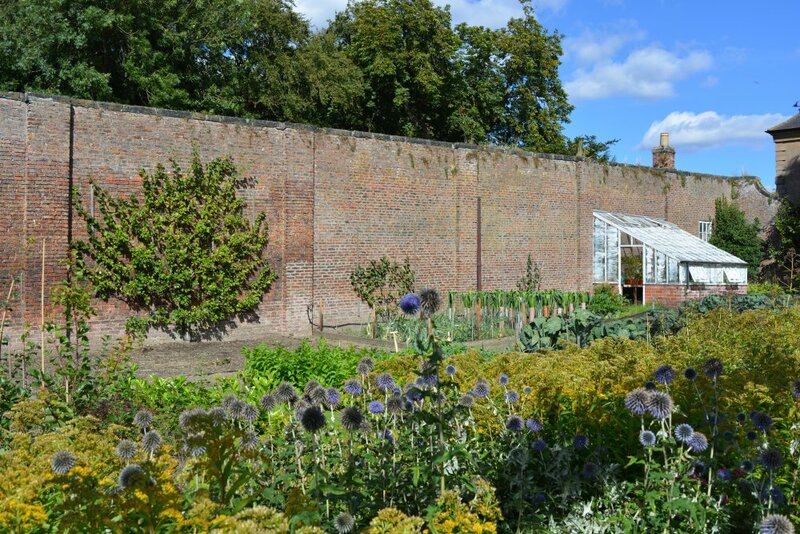 The oldest part of Newburgh Priory, with clear signs of medieval masonry. 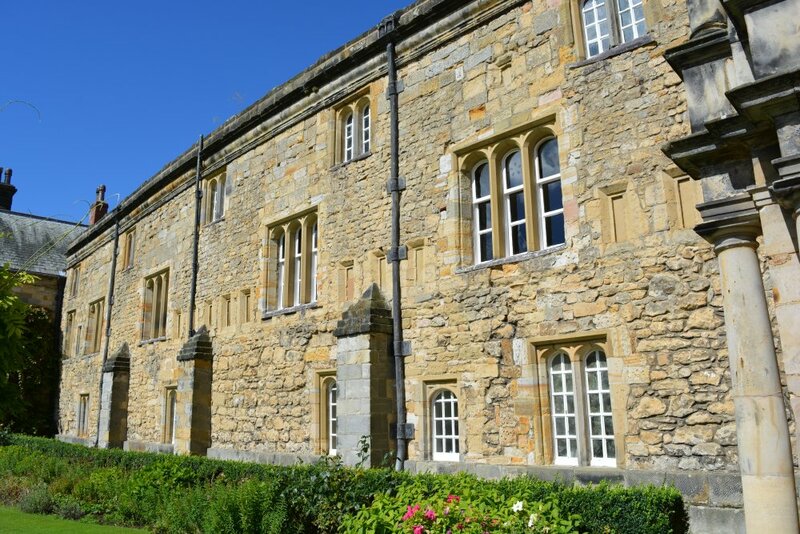 The 'derelict' east wing of Newburgh Priory. 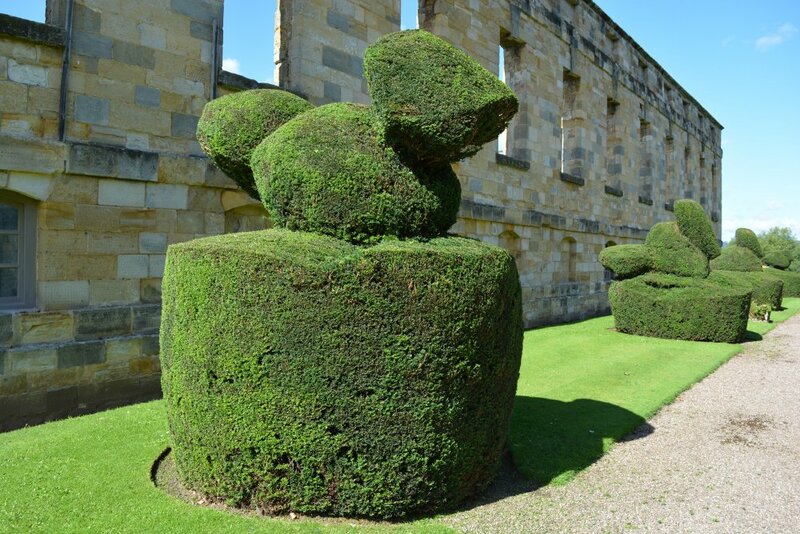 Some fine topiary by the side of the east wing of Newburgh Priory. 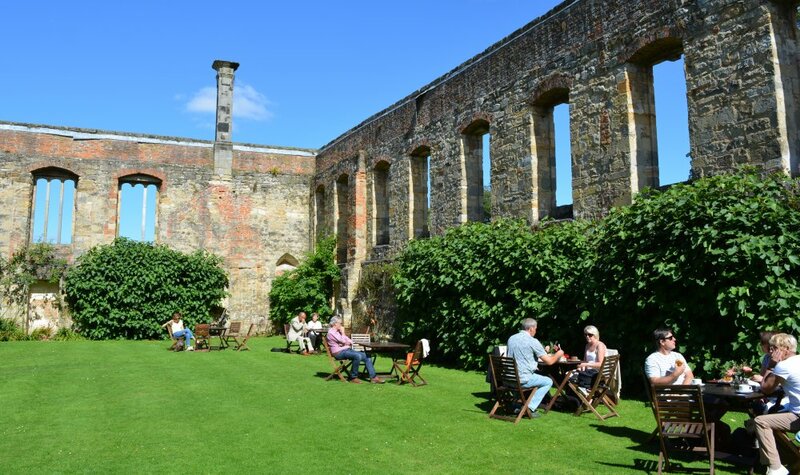 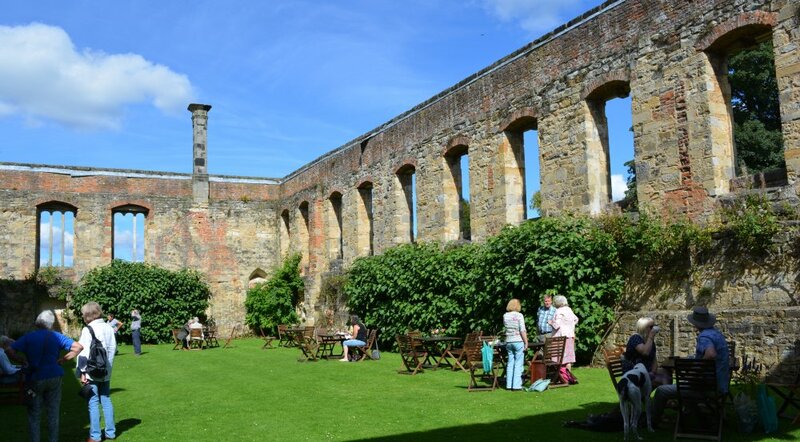 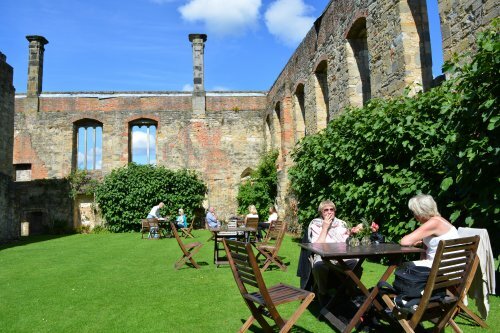 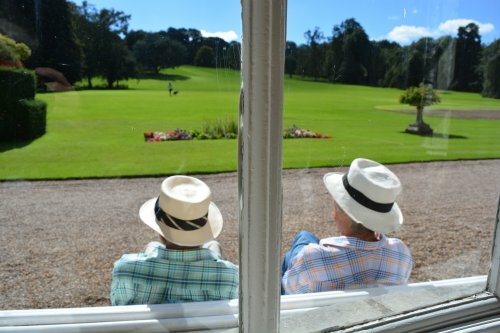 Inside the shell of the east wing of Newburgh Priory you can enjoy refreshments from the cafe. 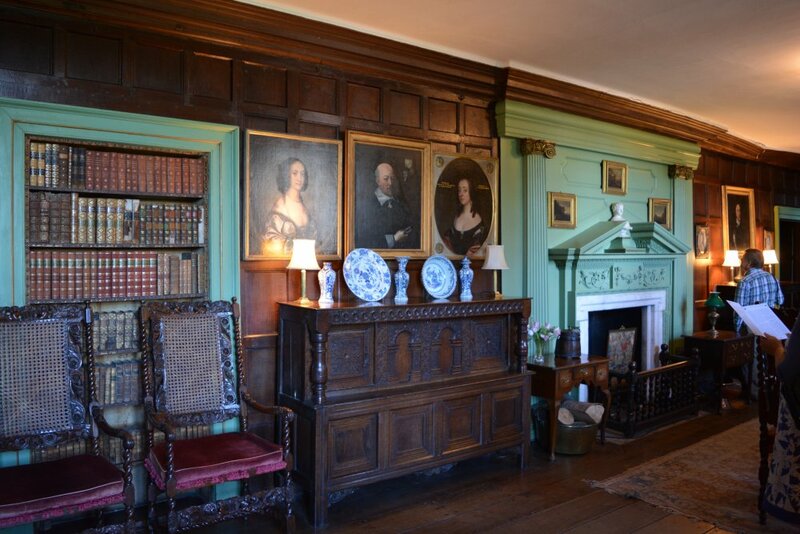 An old tall chimney stack protrudes from the walls of the early Georgian east wing (~1732). 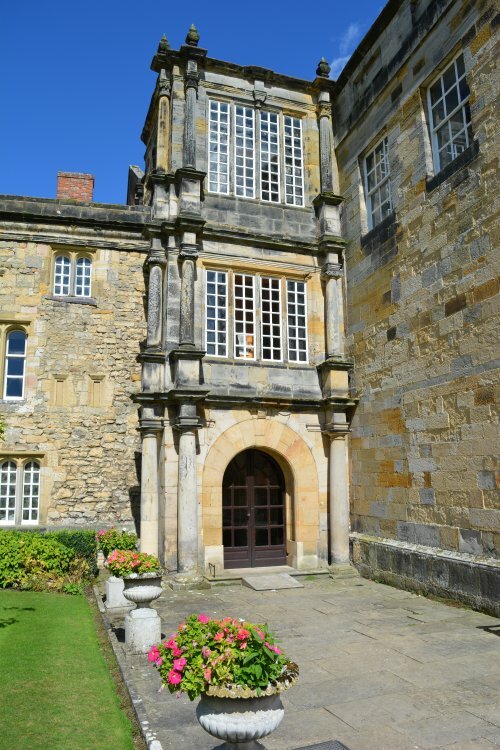 The north face of the east wing of Newburgh Priory. 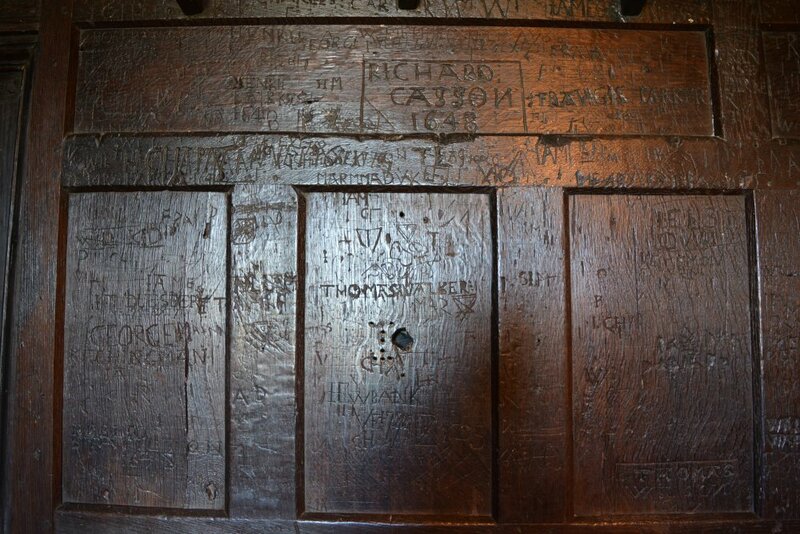 Various names carved into the panelling near the kitchen range. 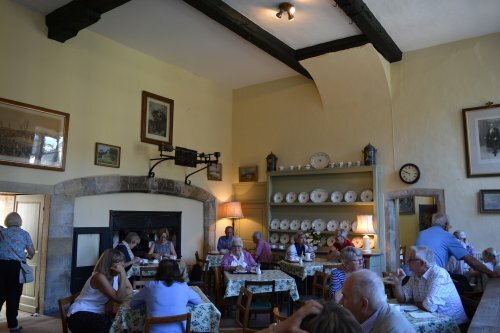 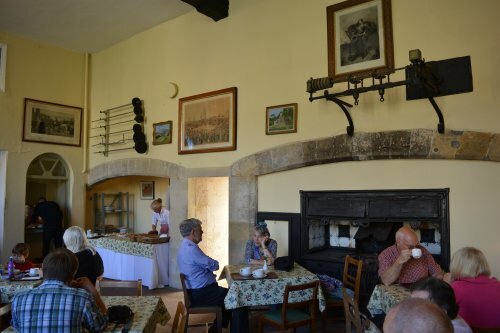 The old kitchen range now serves as the temporary cafe of Newburgh Priory. 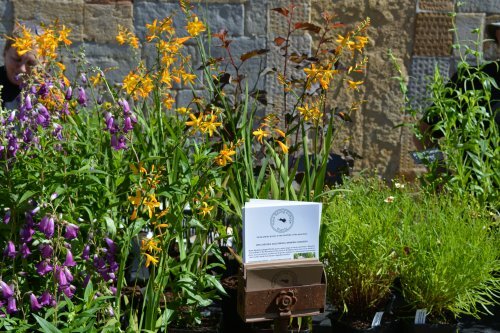 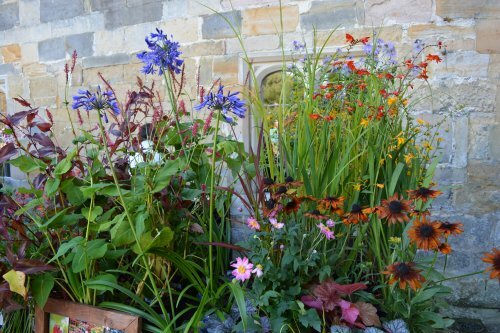 More flower and shrub sales! 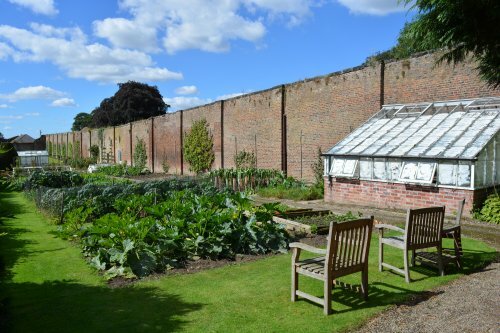 The lovely walled garden of Newburgh Priory. 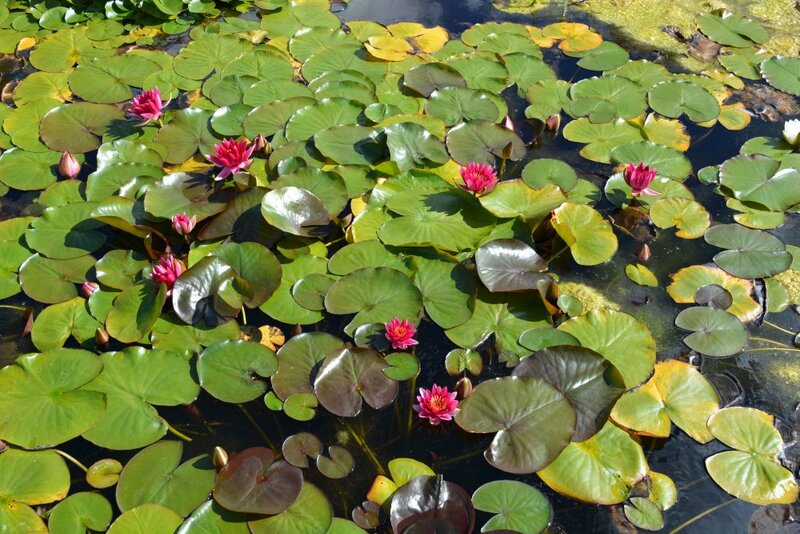 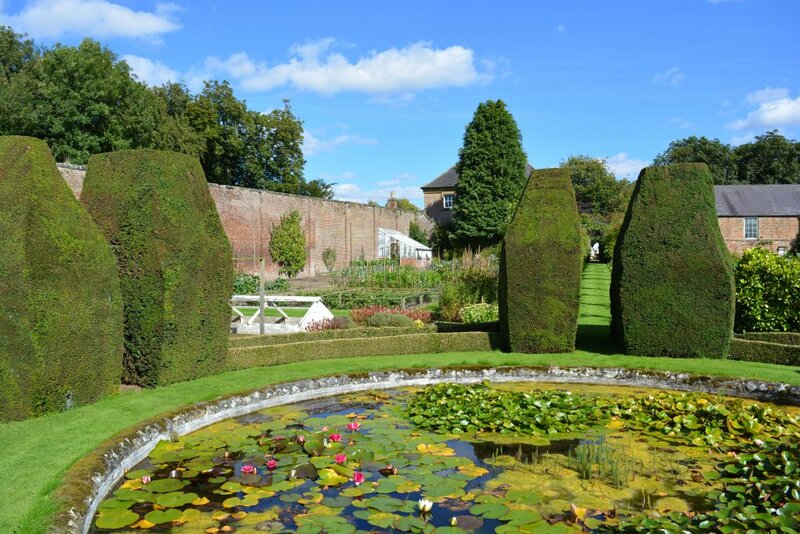 The lily pond in the walled garden of Newburgh Priory. 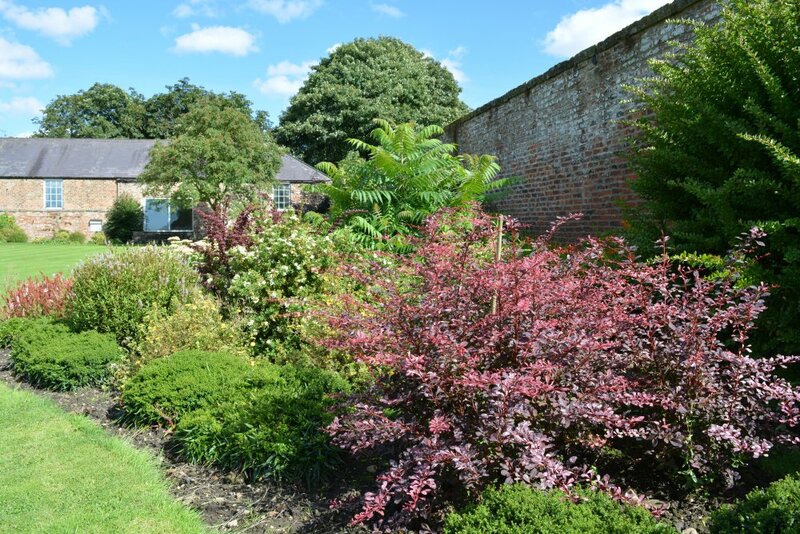 More lovely shrubs in the walled garden of Newburgh Priory. 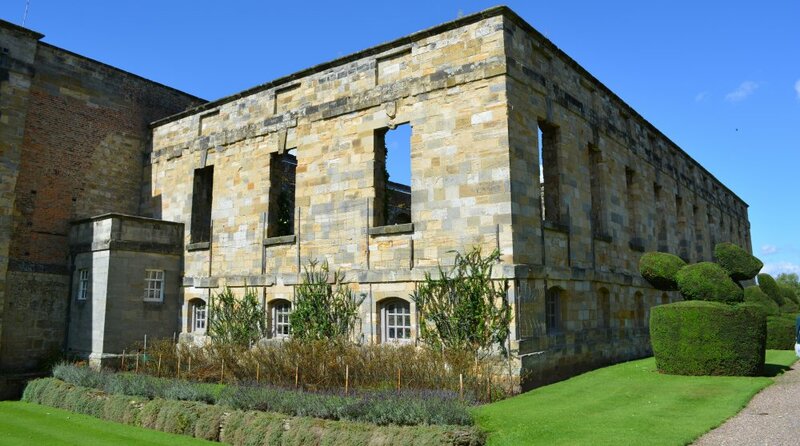 The stable block of Newburgh Priory with two five bays of windows. 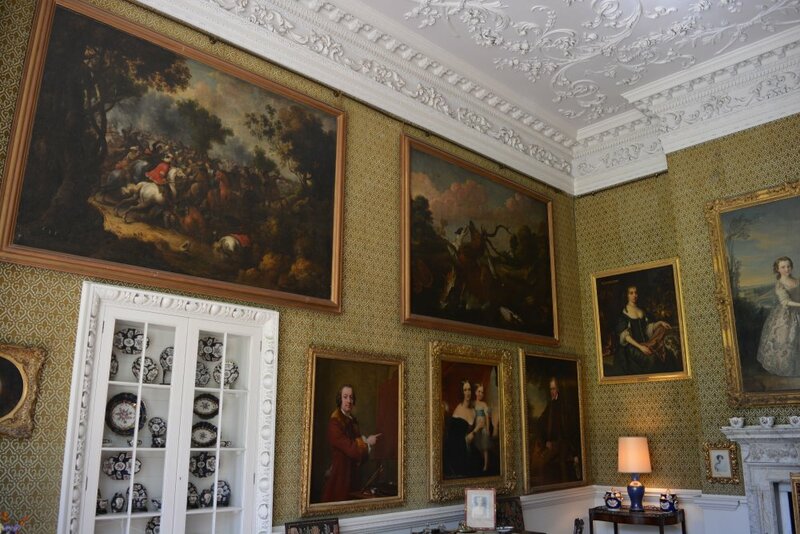 The full range of the south side of Newburgh Priory. 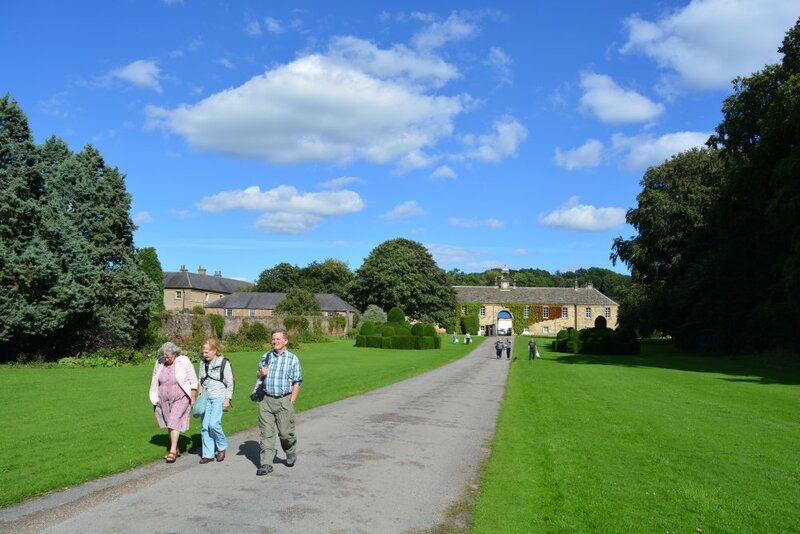 Walking south up the grassy parkland of Newburgh Priory. 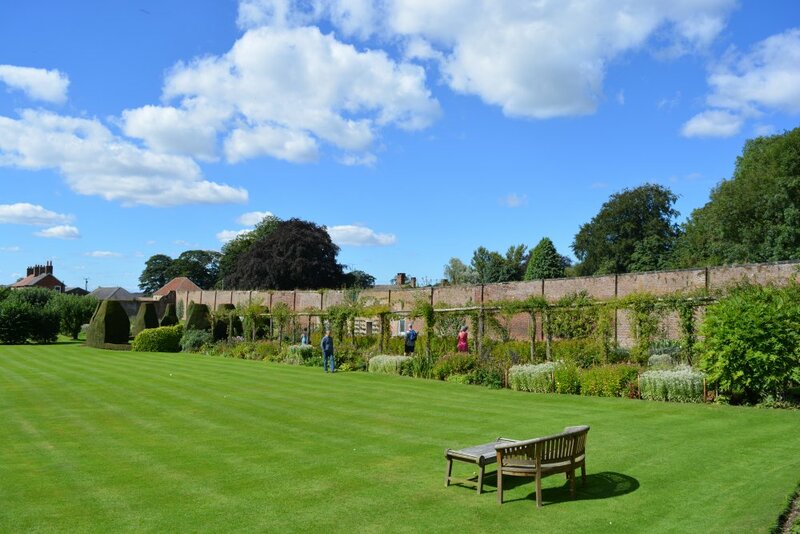 Looking north down the grassy slope to Newburgh Priory. 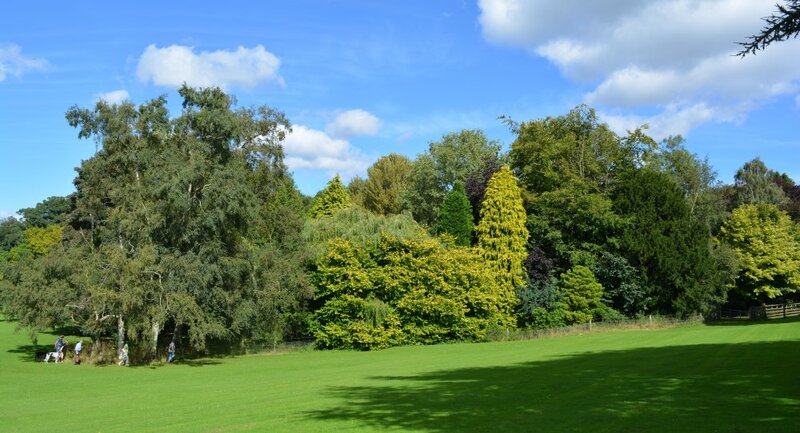 A good variety of trees in the grounds of Newburgh Priory.